London Hackney Carriage taxis that feature the Chiquita bananas branding will be offering passengers the chance of a free ride across zones 1 and 2 on July 16. The "we are bananas" campaign is focused on raising awareness of Chiquita bananas among mothers and millennials. 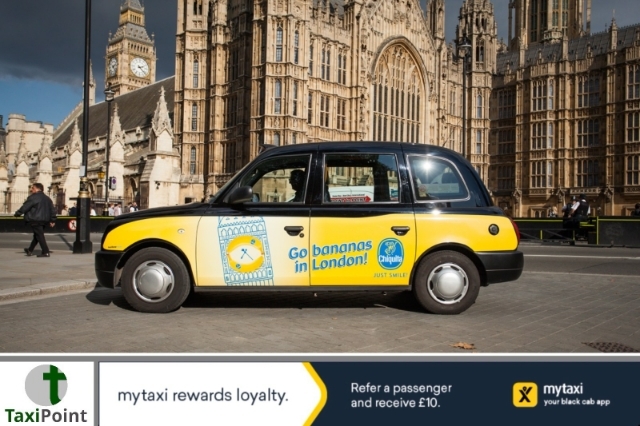 According to CampaignLive, a fleet of London's iconic black taxis will be wrapped in designs featuring Chiquita's stand-out yellow and blue branding creating maximum attention. Lucky passengers who flag down a Branded taxi and present the driver with a Chiquita banana will be privileged to a free journey anywhere in zones 1 and 2. Banana wrapped Taxis will be stationed around Covent Garden Piazza on Henrietta Street and Southampton Street and also Holborn tube station from 9am - 5pm on Monday 16 July. This is the fourth time the company has run a high profile campaign in the capital. The seven week campaign will also see some of the city's red buses turn yellow and blue and will be supported by digital and social activity across the brands channels.